Hello lovely crafters! 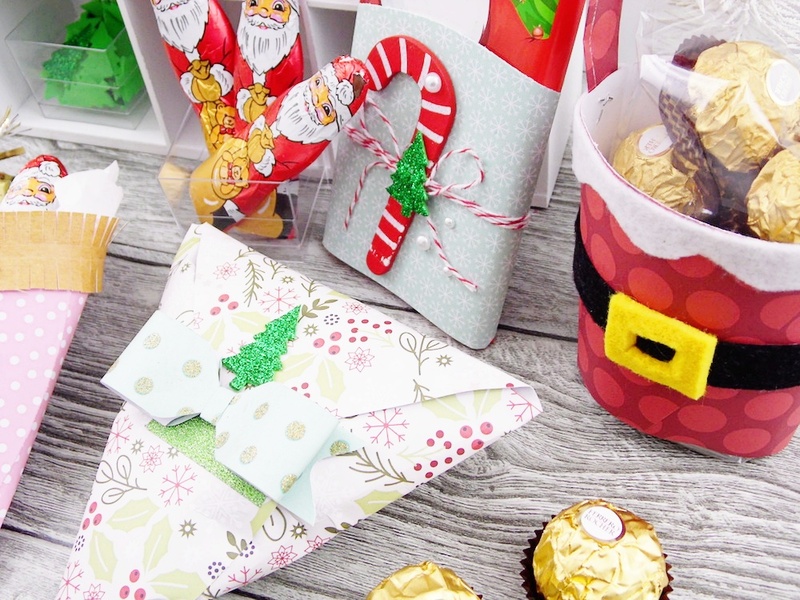 Soraya here today to share a tutorial to make adorable tiny mail boxes for Valentines Day. 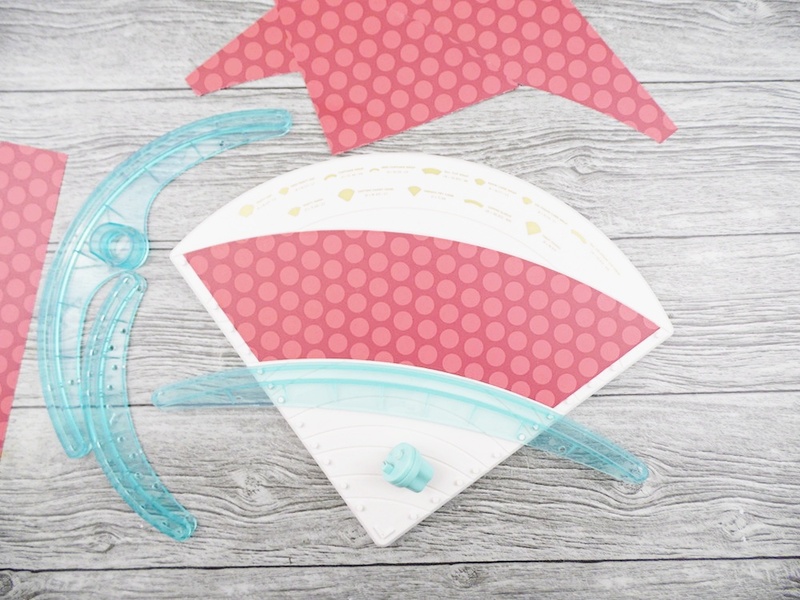 You’ll need to grab your 1-2-3 Punch Board, the Envelope Punch Board, the Trim & Score Board and some pretty Valentines papers! Let’s go! First of all, create a rectangular box using the 1-2-3 Punch board (I love this tool so much!!) following the instructions on the guide. Once you’re done with the box, create the opening drawer and the slot that will allow you to put in and pick up your love letters! I used the handy cutting tool and a metallic ruler. Place some adhesive tape all around the folds and stick one side at a time. Finish with the Mini Glue Gun to secure the bottom of the box. 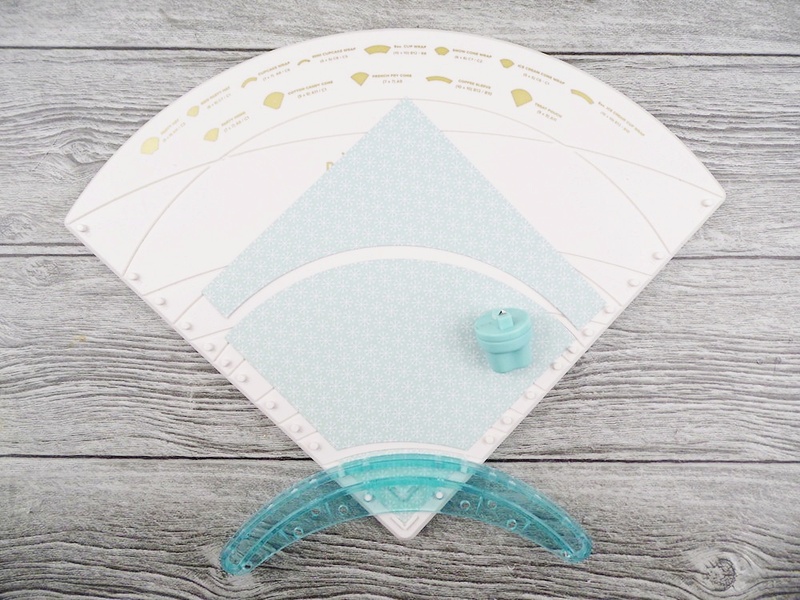 Use the Clear Cut Punch to make a circle that you will split in two. This will be the top of the mail box. Now add a lovely button or a pearl to create the drawer handle. Repeat the same process for the other boxes and decorate them. I made 4 of them, one for each member of my family so that we can exchange sweet words and expressions of love. Use the Mini Envelope Punch Board to make adorable tiny love letters. They are so cute! And voilà! The mail boxes are ready to make us happy! Hope you had fun joining me today! Happy Valentines Day everyone and until next time! Hello everyone! 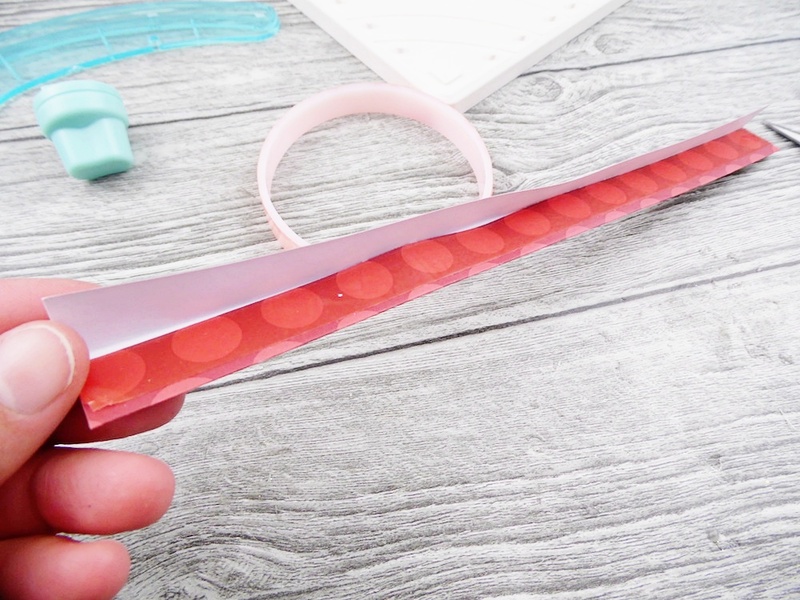 It’s Eva here today sharing with you a Valentine’s Day decoration using the new Big Happy Jig. If you love the regular size Happy Jig, then you are going to LOVE this new tool! It is perfect to create home decor projects with handlettering words and symbols. The new BIG Happy Jig works uses a wider wire and you can also use neon wire! How cool is that? To create my decorations I started with a 10.5 inch wide piece of cardstock. I measured 2.5 inch on each side and created the banner. After that, I used my Crop a Dile to punch holes on the bottom and top of my wall banner. I used my Big Happy Jig to create an ampersand with gold wire. This design is from the regular Happy Jig tool guide, you don’t need to change anything, the designs work perfectly on both tools. 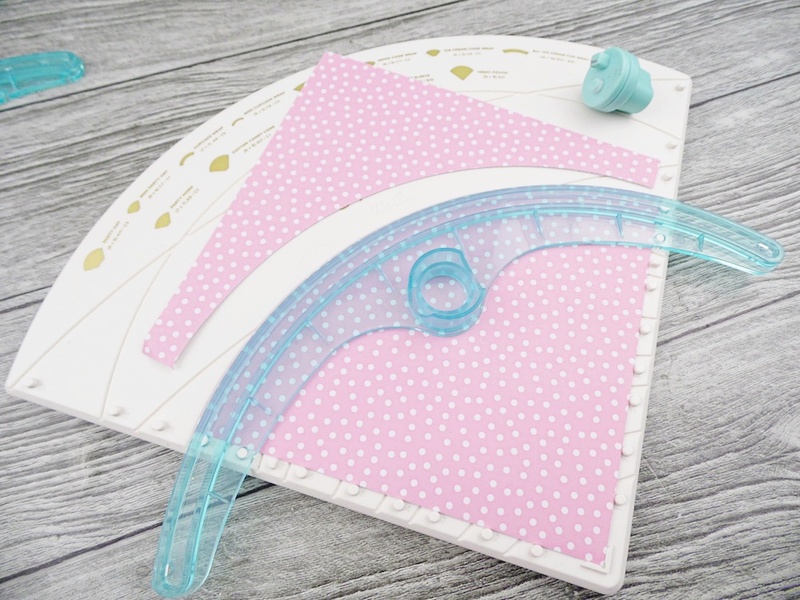 One thing I love about the Big Happy Jig is that you can remove the peg case and the mat it is flat so it doesn’t use much space on your craft room. Once you are done with your design bend the edges so you can insert the design on the banner. I also used one design from the Happy Jig Instagram account (werhappyjig) and made two connecting hearts. Use cotton wool and your Tassel Loom to create 5 inch tassels and one 2 inch tassel. I decorated the tassel with Stitch Happy Gold Thread so they coordinated with the wires. Use the 5 small tassels to decorate the bottom of your banner and some thickers to write the “you” and “me” words. I love how the ampersand floats over the banner! For my other decor I used the 2 inch tassel and some wood beads to decorate the two hearts. I made this tassel with all 3 colors of yarn, I think it looks very cute! Finally I made a heart banner with some hearts I cut with my Clear Cut Punch. I used the “Loves Me” collection by Pebbles Inc because the colors matched perfectly my yarns! What do you think? The Big Happy Jig gives you so many possibilities! What would you make with it? 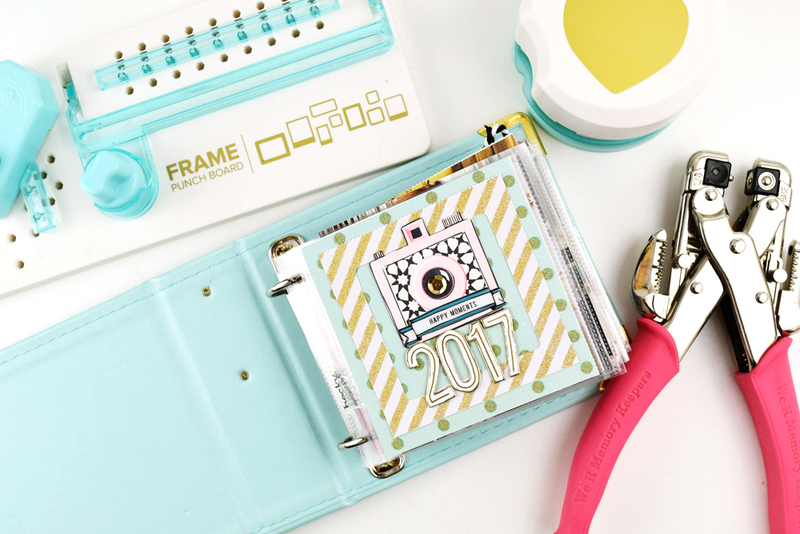 Hello We R Memory Keepers friends and fans, Becki here to share a fun “Year in Review” mini album with you. 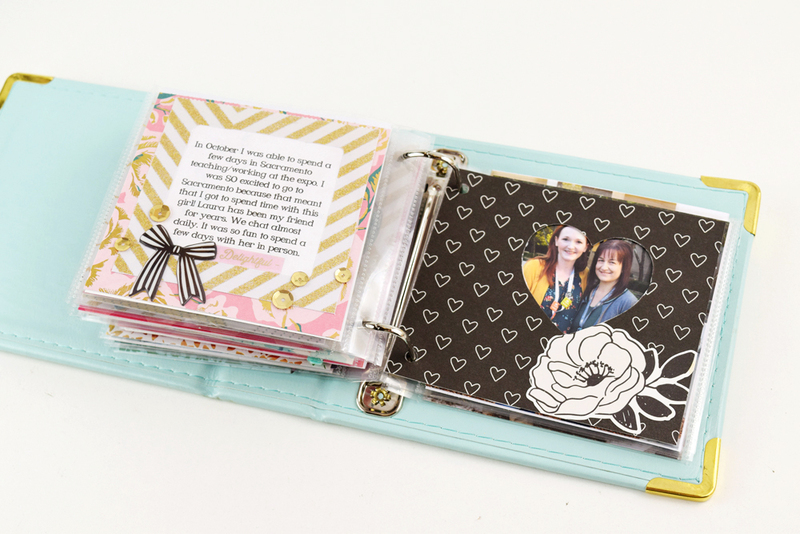 I used three of my favorite We R Memory Keepers tools to create this mini album. I absolutely love how this album came together. When I started creating the album I thought that I would include 5-10 of my favorite photos from 2017. As I gathered photos, I realized that there was no way to narrow down the number of photos to 10 to tell the story of our year. 2017 was a very eventful year for our family. This year in review album has over 20 photos. I streamlined the creative process by printing all my photos at 4×4. In this album all the photos are on the right side and the journaling is on the left. To create a space for all the journaling, I used the frame punch board to create 3 ½ x 3 ½ square frames. Then, I printed the journaling to fit inside the frame. On a few of the pages, I used the clear cut punch to create a window so that the reader could get a sneak peek of the photo that was on the next page. It was so easy to create a cute heart window using the clear cut punch. I love that I was able to move the punch around the page so that I could make the heart window where ever I wanted to on the page. Even though, the album contains a LOT more photos than I originally intended, I love the story that it tells. 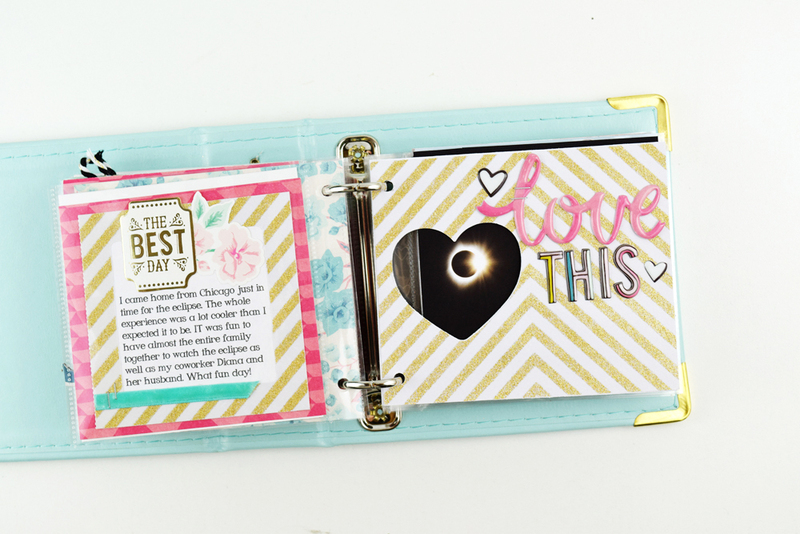 Using a few of my favorite tools from We R Memory Keepers made creating this album so easy and fun. Thank you for stopping by the We R Memory Keepers blog. Happy 2018 my friends! Hello everyone! 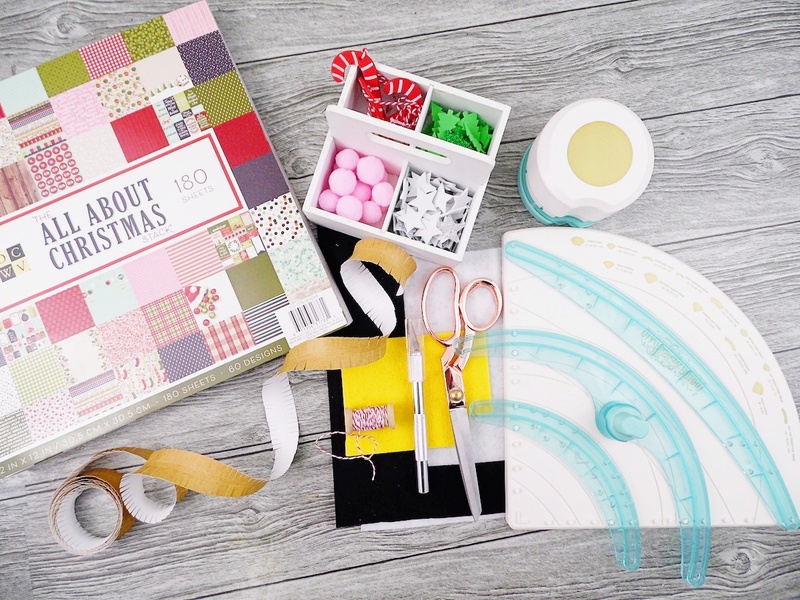 It’s Eva on the blog today sharing 3 different Christmas hoops made with a few We R Tools! Before scrapbook, I used to do a lot of embroidery and have some supplies in boxes: threads, needles and of course hoops. This year I decided to use some of those hoops to create some Christmas decorations. I love to reuse things and create something beautiful with things I already have! I created three hoops using different tools, the first one is a mini pom pom hoop. Choose some colored yarns and create small pom poms, We R has a Jumbo Pom Pom Maker and also a set of three pom poms , the smallest one is really cute and I haven’t seen that size a lot! 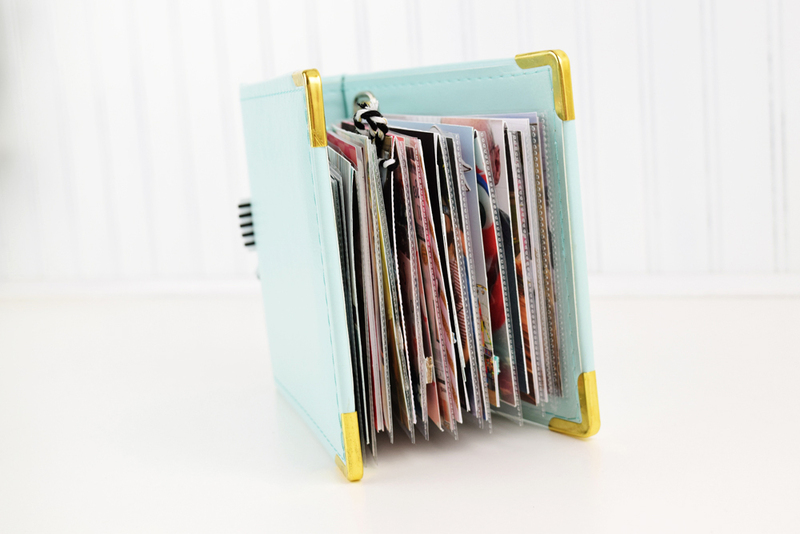 Is perfect for embellishing mini books and small decor projects. Use your Precision Scissors to cut the yarn and trim a bit your pom pom. To glue your pom poms to the hoop use the USB Hot Glue Gun, I love that I don’t need to have and outlet nearby! I simply use my phone’s power bank! 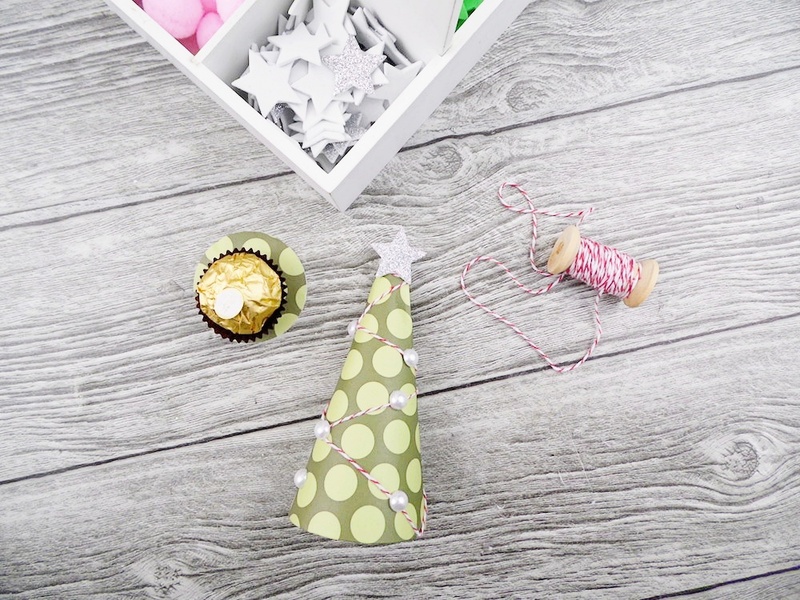 Finally, use the Bow Loom to create the perfect bow and decorate the top of your pom pom hoop. For the second pom pom hoop I used my Tag Clear Punch and made 9 banners in different colors. I bend them creating a banner and then put some letters on top. With the Word Punch Board you can customize your hoops and soon you will have the chance to create numbers and symbols, how cool is that? Finally I embellished my hoop with some die cuts from Pebbles’ Christmas line Cozy & Bright. The last hoop is my favorite! I used the Stitch Happy Pen to write a word on felt. I used my Stitch Happy white thread and it was so easy and fast! I really like how it turned out. To give my hoop a nice and polished look; I cut the felt, glued it to the back of the hoop and also put a felt circle in the back to protect my work. These Christmas hoops are perfect for my tree but you can also use them to decorate a wall or to give them to a friend! Which one is your favorite? Hello happy crafters! Soraya here today to share a cute holiday gift idea using the amazing Happy Jig : a holiday mug! Yes, this is definitely the hot cocoa season so why not offer a special mug to your family and friends?! So let’s make it! First of all, use the various sizes of pegs of your Happy Jig to create the word “yum” (don’t forget to allow more lengh of wire on both edges). I chose to use the pink wire. With the Trim & Score board, trim a large stripe of paper and with the Clear Cut Punch, create a pretty label. Cut the label in two parts and glue them on the strip of paper that you previously placed around the mug as shown in the photo below. Now for the last part: cut a beautiful heart with the Clear Cut Punch and add some gold washi tape on the mug for a festive look. The Happy Jig word comes now on the top of your decoration. I love how it turned out! And a small glittered tree is perfect for the final touch! Et voilà! I hope you had fun joining me today for this holiday tutorial! Have fun with your Happy Jig and until next time! Hello, We R friends! Laura here today to kick off Holiday Treats week. Often around the holidays I like to bake homemade goodies, but to be honest, I don’t always have time to create something from scratch. If I can’t bake something, my next go to treat is candy – in particular, anything nostalgic. For Christmas this means candy canes, peppermint Christmas nougats, peanut brittle, or hard candies. 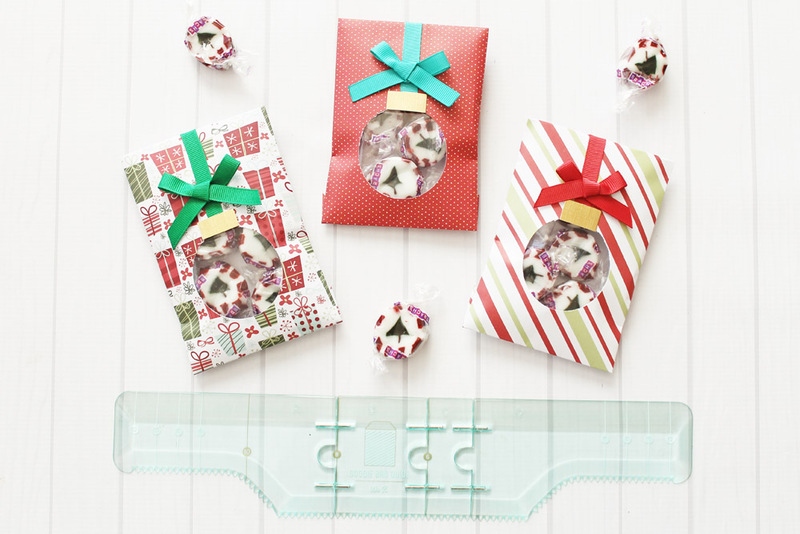 Today, I am going to show you how to make these adorable ornament treat bags with only a few simple supplies like the goodie bag guide. These little bags would work great as party favors or even to pass out at a class party. 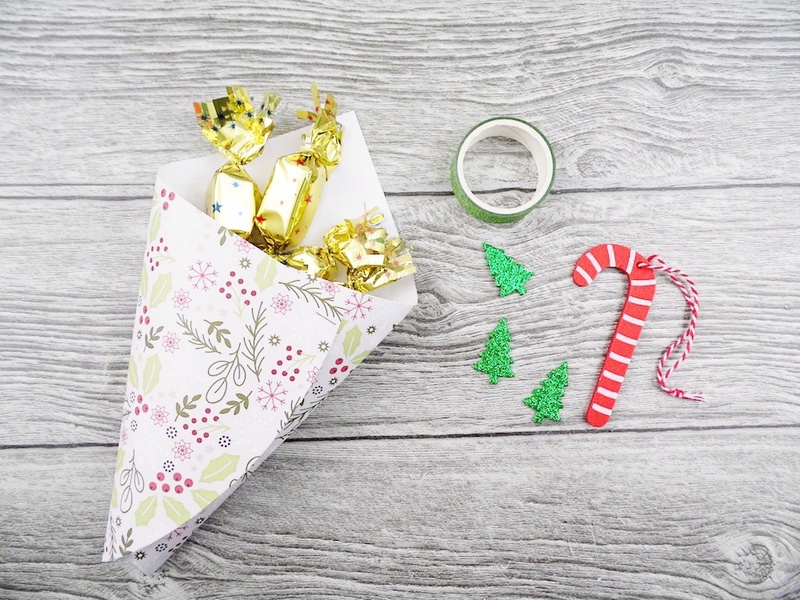 Start by choosing some pretty holiday papers. Mine are all from the DCWV All About Christmas Paper Stack. 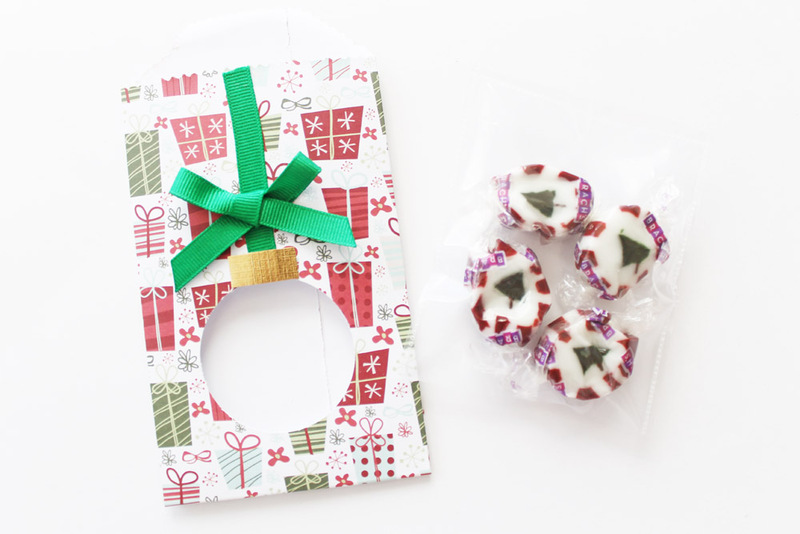 Use the Goodie Bag guide to create a treat bag that is 3 ½” wide. 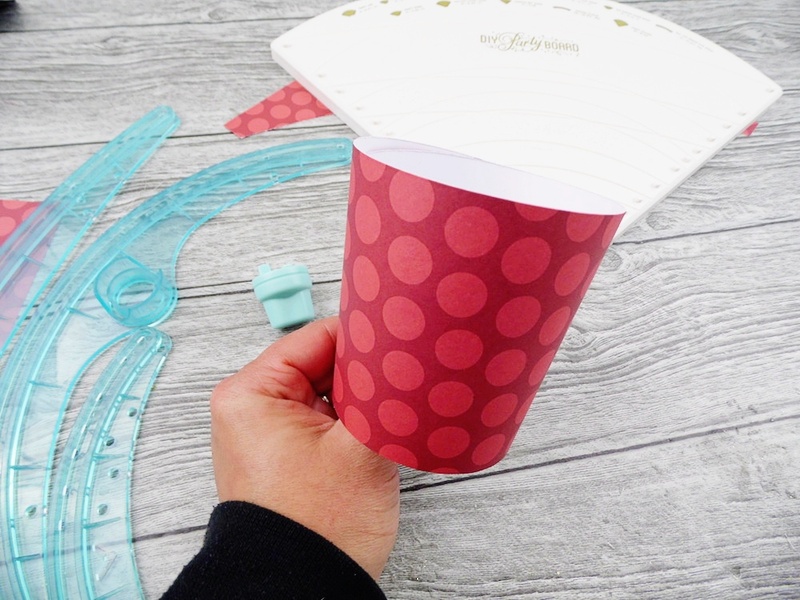 Before you assemble the bag, use the clear cut circle punch to cut a circle in the bottom half of the front of the bag. The clear cut punch works great for this because you can position it exactly where you want it. Assemble the bag using adhesive. 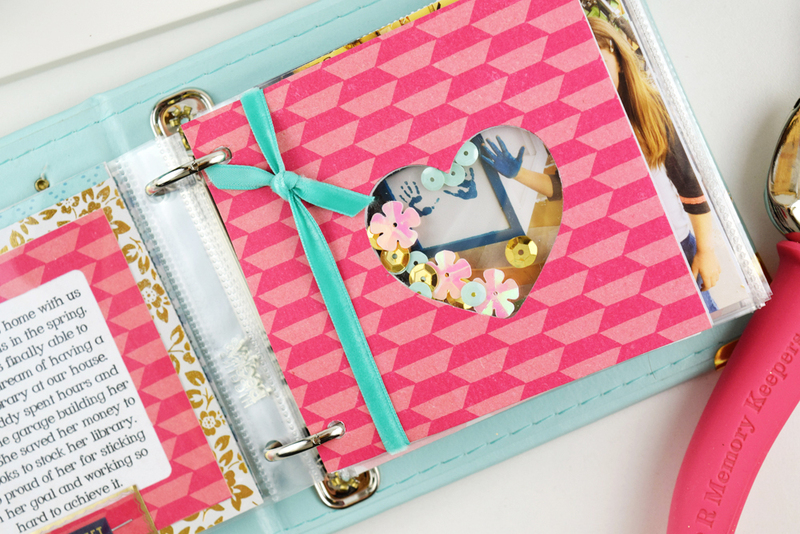 Create a 3” pouch using one of the 4” photo sleeve waterfall sleeves and your FUSE tool. Fill it with your favorite candy and then fuse the top closed. 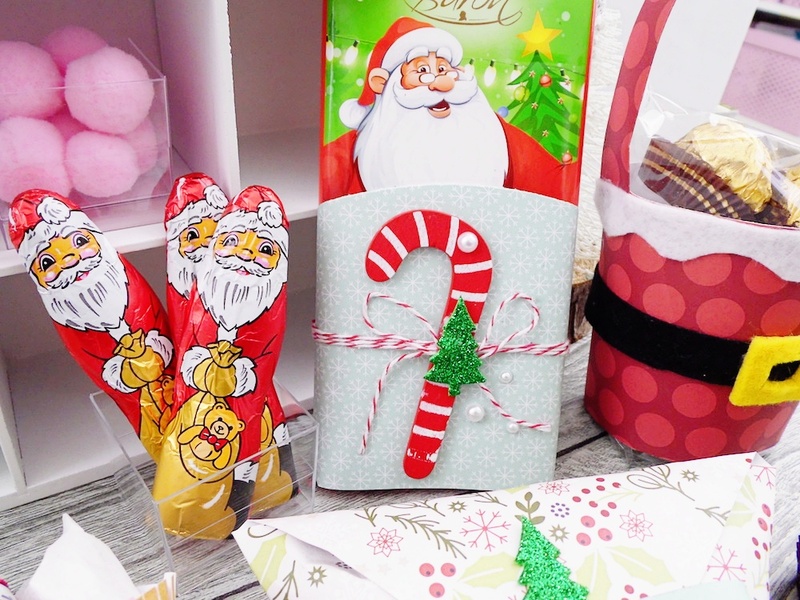 Decorate the front of your treat bag with a ribbon, a small gold or silver rectangle, and a ribbon bow. I attached everything with my Sticky Thumb adhesive. 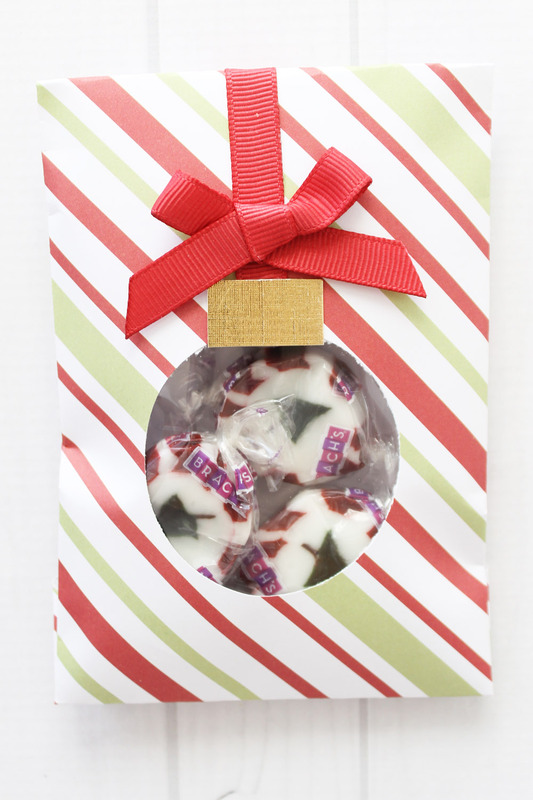 Place the fused candy bag inside the treat bag, fold over the top, and seal it with adhesive. 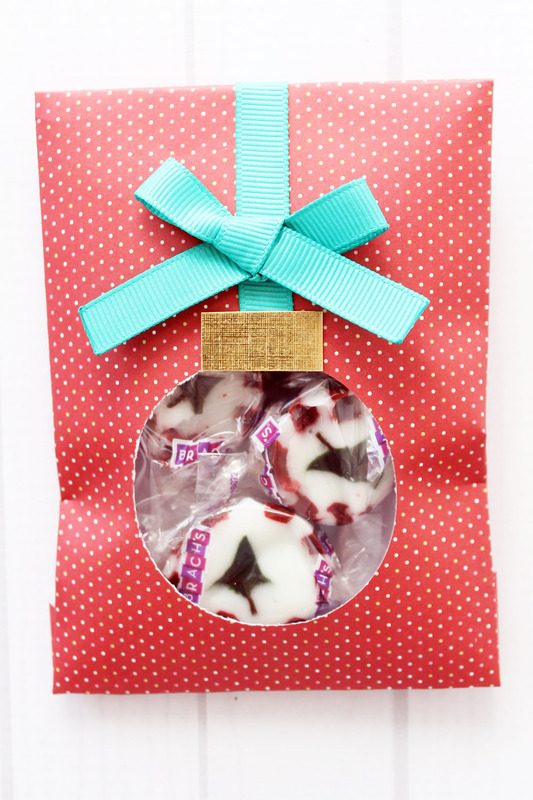 The candies make a perfect little ornament showing through on the front of the bag. 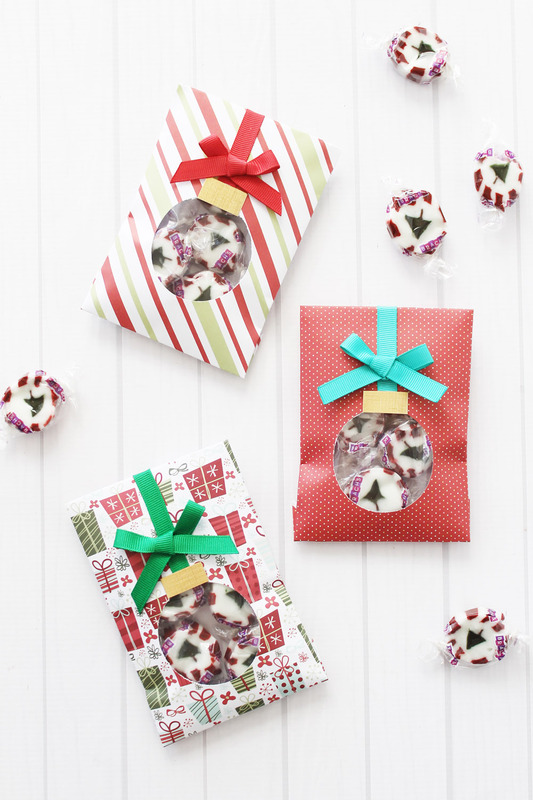 You could also fill the ornament treat bag with a cookie, brownie, or any other homemade treat, as well! Hello We R Memory Keepers fans! Soraya here to share some holiday treats to offer to your family and friends because Christmas is around the corner! 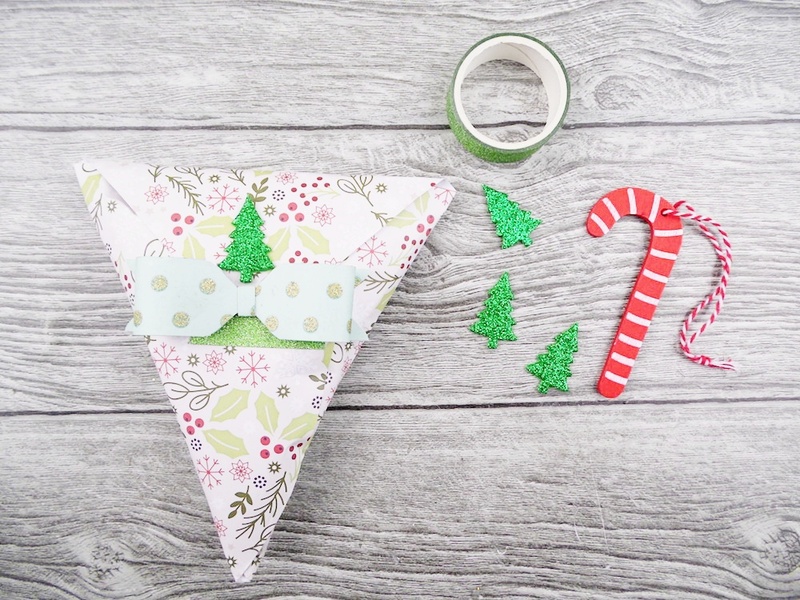 It’s the most wonderful time of the year and at We R Memory Keepers we have the best tools to inspire you creating cute and fun treats! 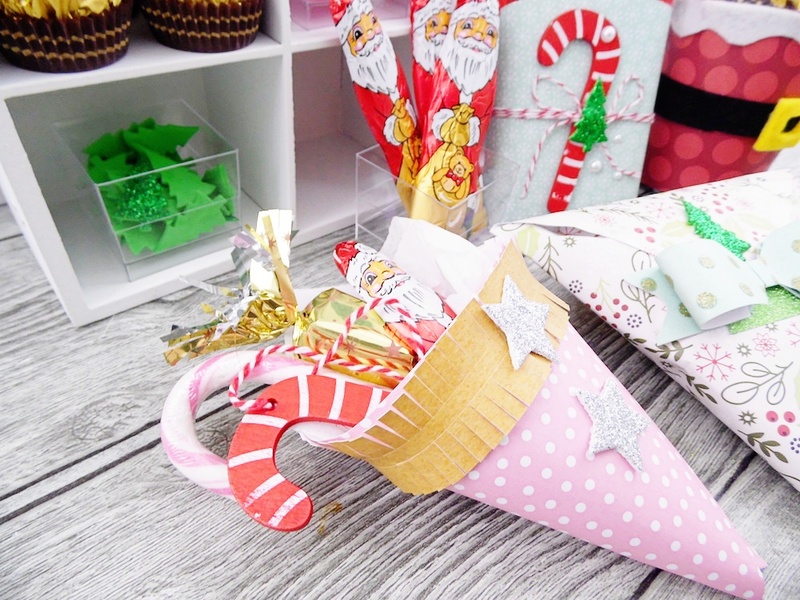 To make these five boxes and pouches I used the amazing DIY Party Board. This board allows you to create so many different projects! 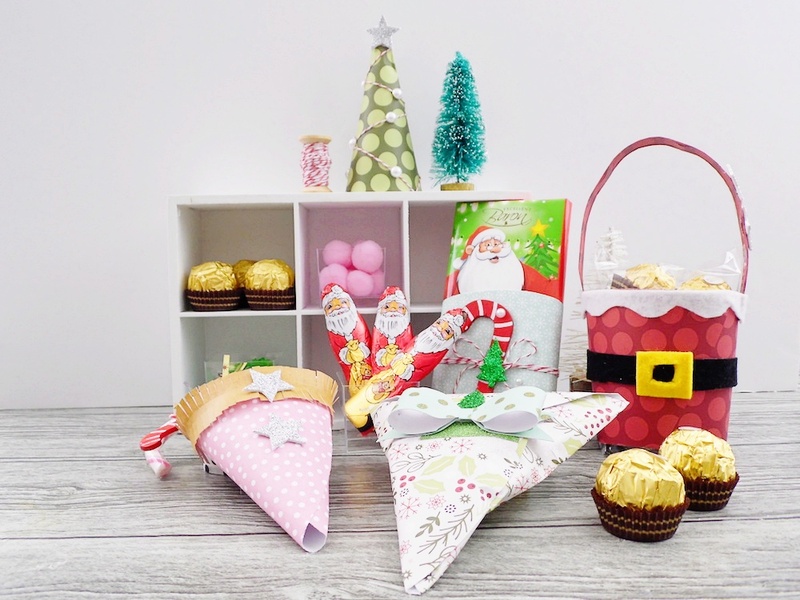 We’ll be making a little basket, a treat pouch, a chocolate bar paper wrap, a French fry cone and a Christmas tree! 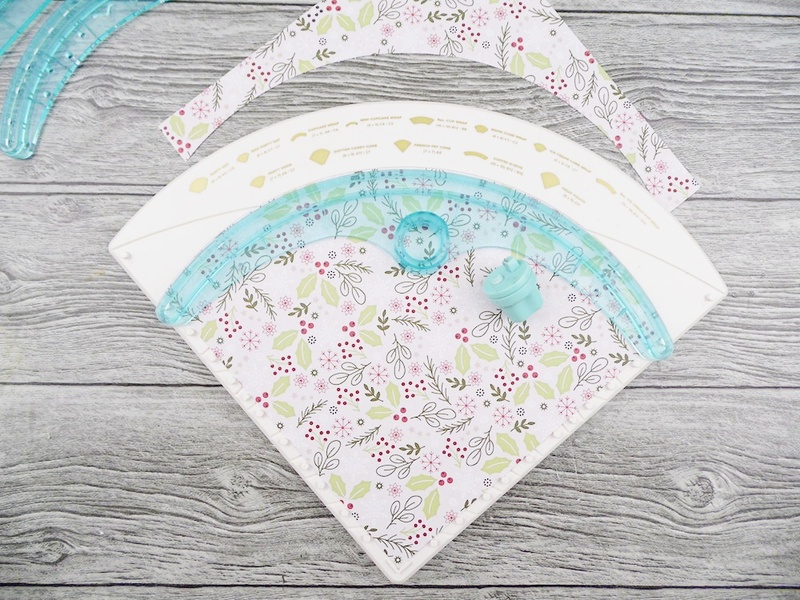 So you’ll need patterned papers, scissors, felt, embellishments and the Circle Clear Cut Punch. 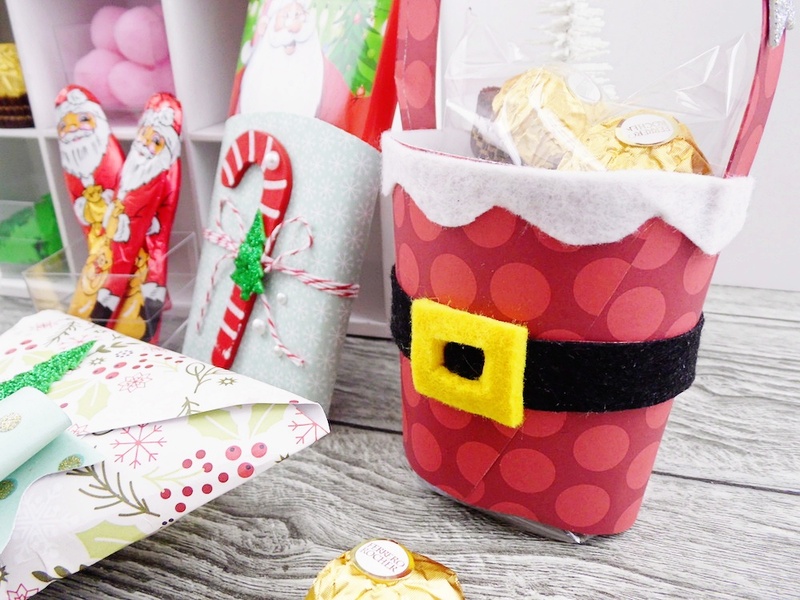 Santa’s basket: use the DIY Party Board to create a big cup wrap with a 10×10 red patterned paper. 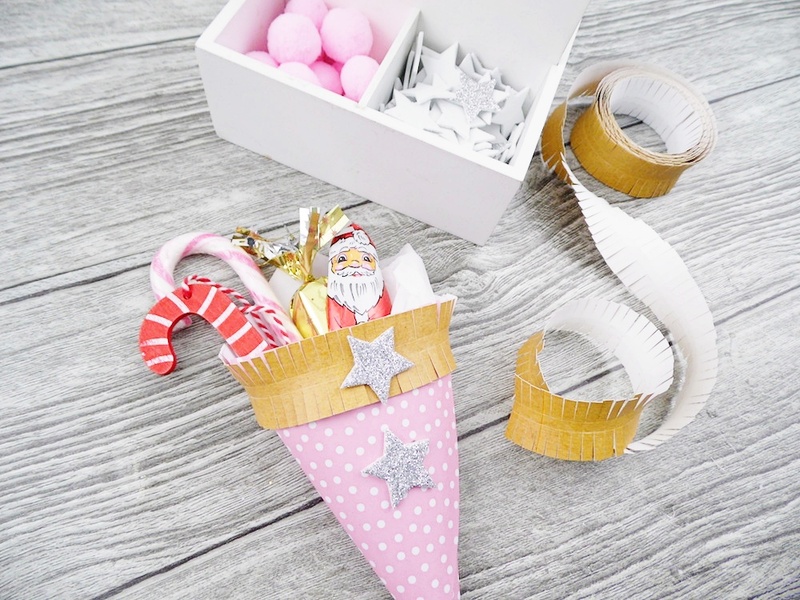 Add a thin strip of paper to create the handle of the basket and cut some pieces of felt to create Santa’s belt and some snow all around the cup. 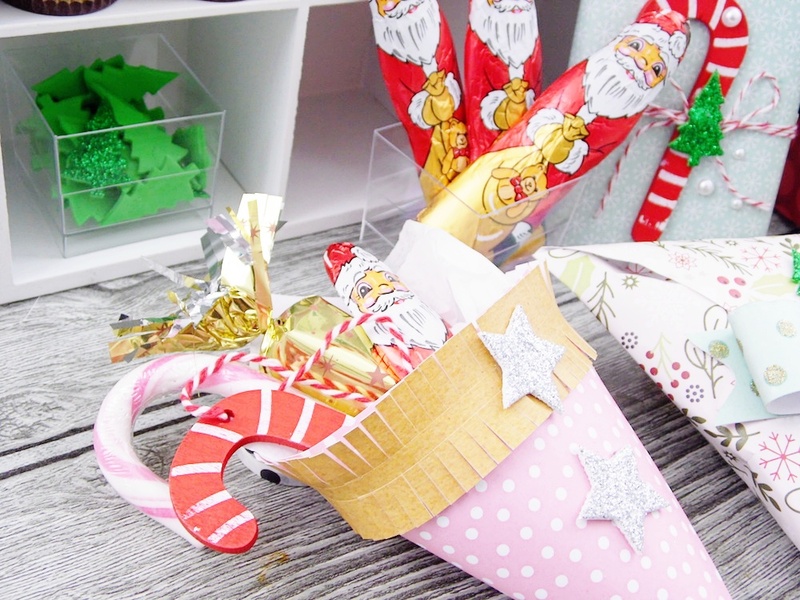 Place some yummy chocolate in a plastic bag before putting them into the basket! 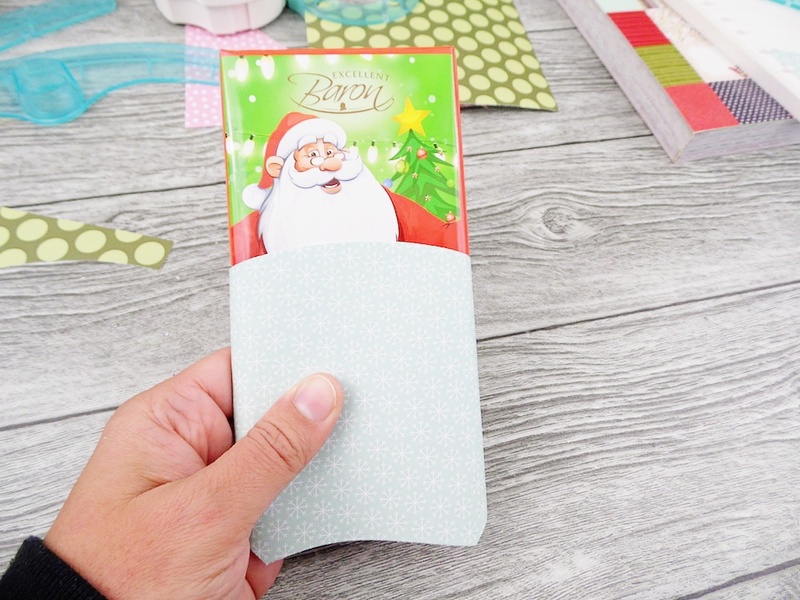 Treat pouch: use a 9×9 patterned paper to create the pouch. 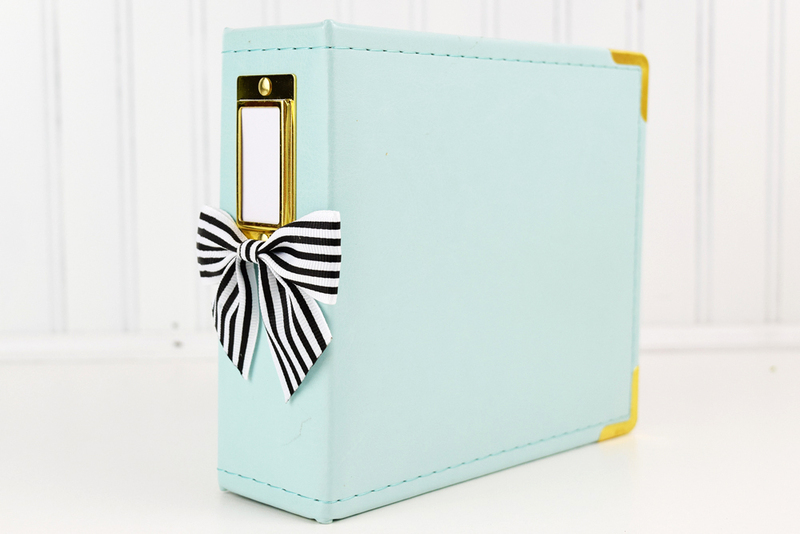 Fill it with delicious sweets and add a bow to decorate it! 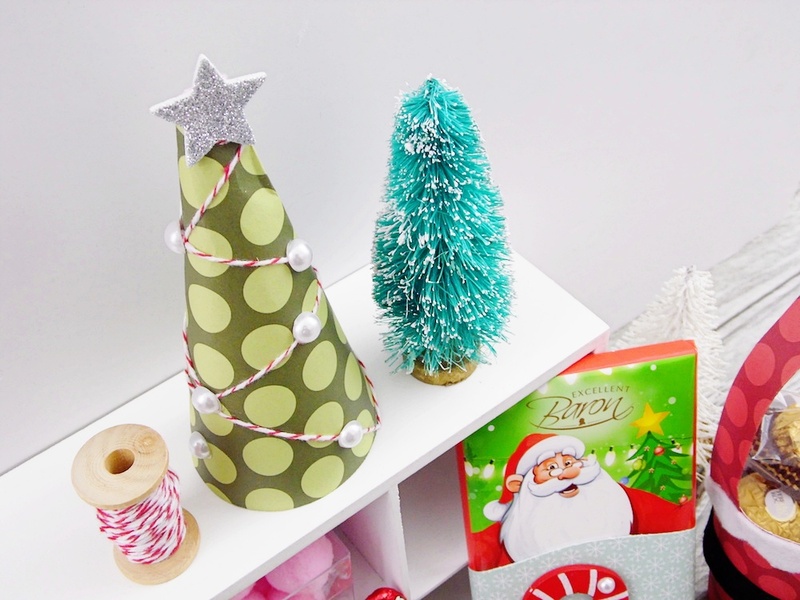 You can add more glittering washi tape and foam stickers (like the tree). 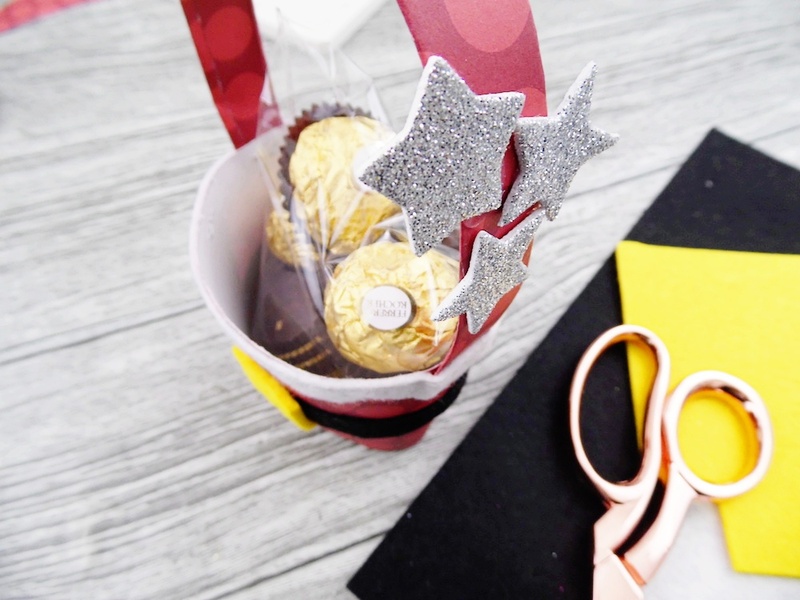 The candy cone: use a 7×7 patterned paper to create a french fry cone and decorate it with a border of gold fringe and some silver stars! Now you just need to fill it with chocolate and candy canes. So cute! 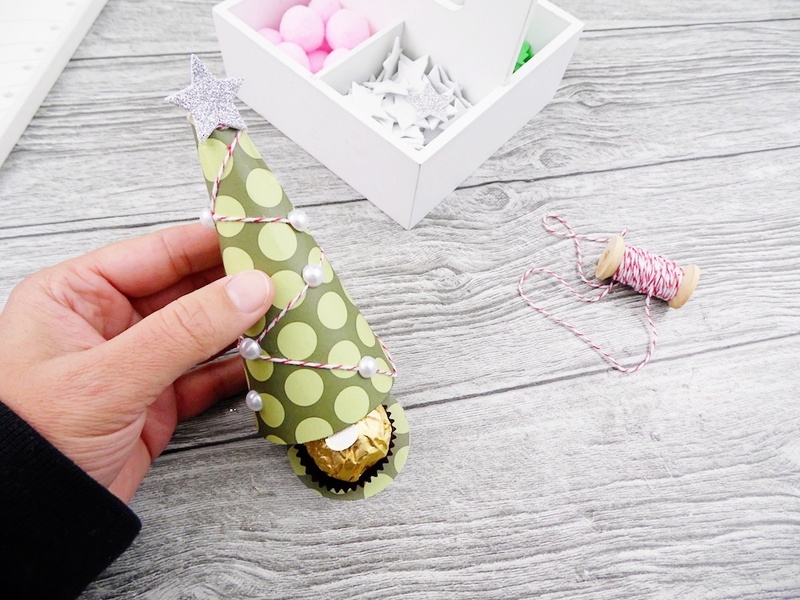 The Christmas tree: use a 6×6 patterned paper to create the shape of a mini party hat that will turn into a Christmas tree! Add a star on top and some red baker’s twine all around the tree as a garland. 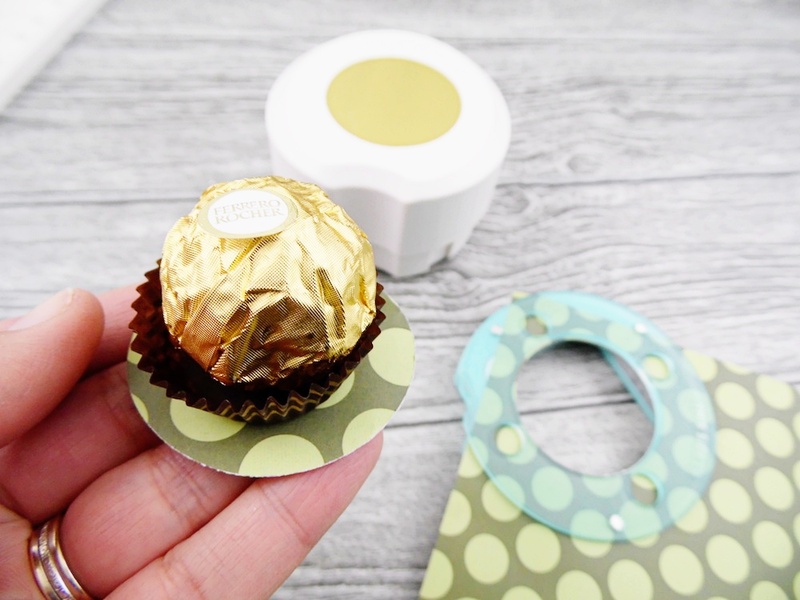 Stick some pearls and use the Circle Clear Cut Punch to create a circle base that will be the chocolate holder! So fun to hide the chocolate inside the tree! 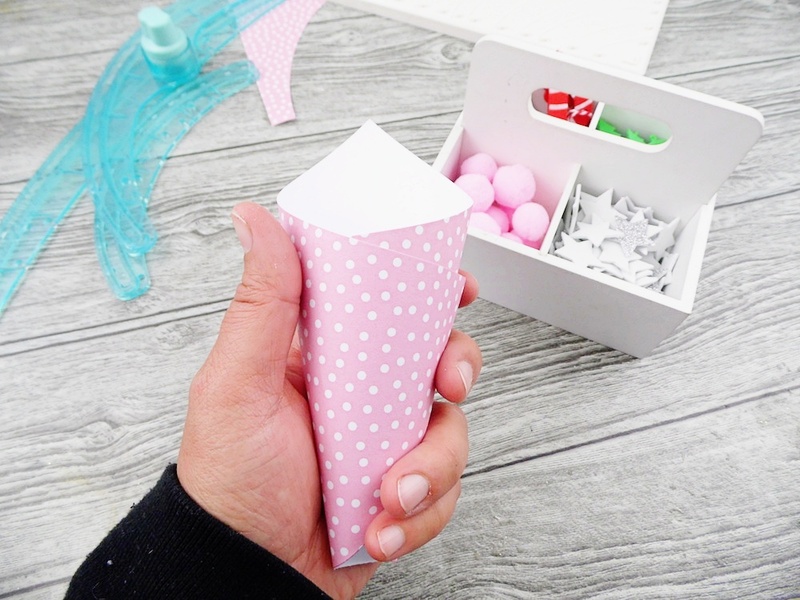 The chocolate bar: use a 6×6 patterned paper to create a snow cone wrap! 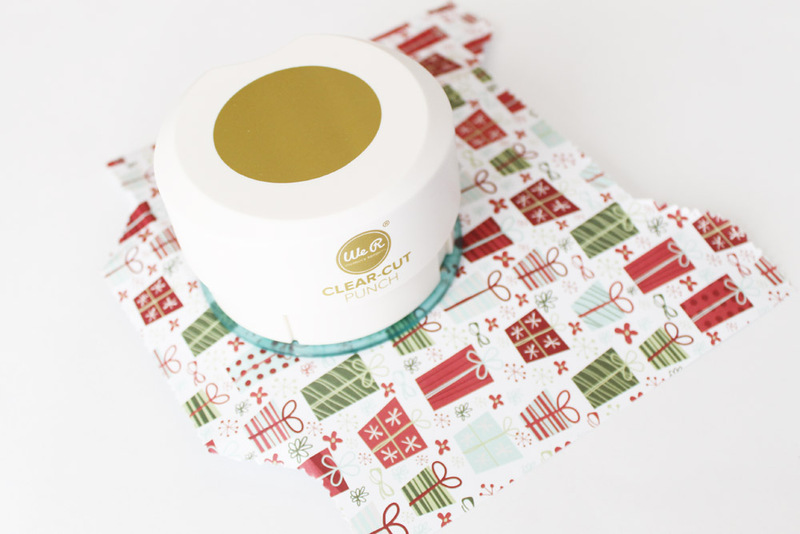 This wrap will perfectly fit the chocolate bar! Add some baker’s twine and holiday embellishments. Hope you had fun joining me, happy creating and happy holidays to everyone! Hey friends, Laura here today! One of my favorite things to make is little goodie bags to hold treats. 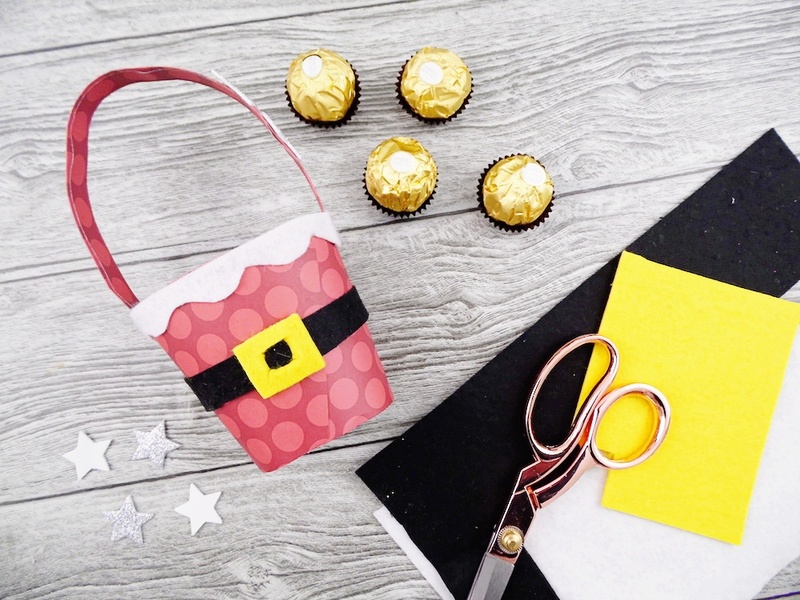 The Goodie Bag Guide makes it so easy to do out of any paper you have on hand, so you can coordinate it perfectly to the holiday or party theme of your choice. 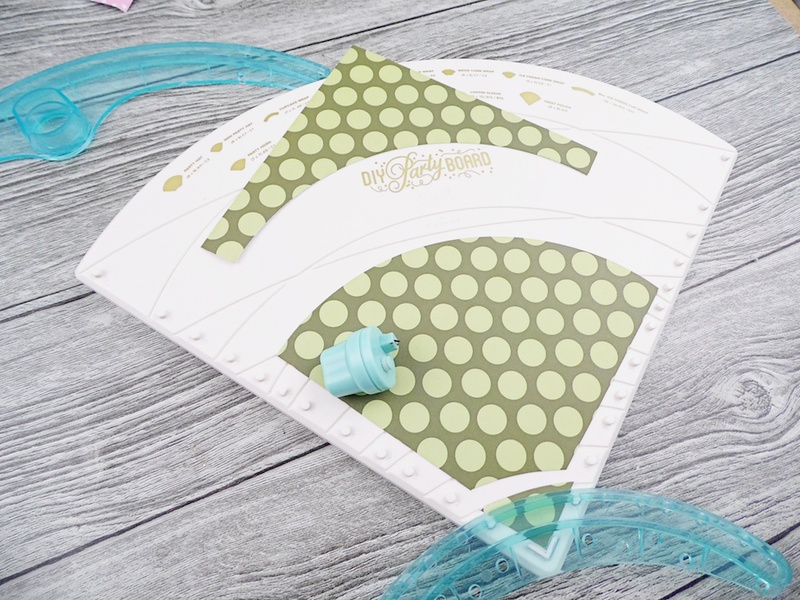 My go to set up for a small goodie bag is to create the bag, add a couple of banner pieces in coordinating colors, find a die cut that matches the theme, and then add a sentiment. I then either tie, staple, or clip the bag closed. This design is a cohesive way to pull together any theme. 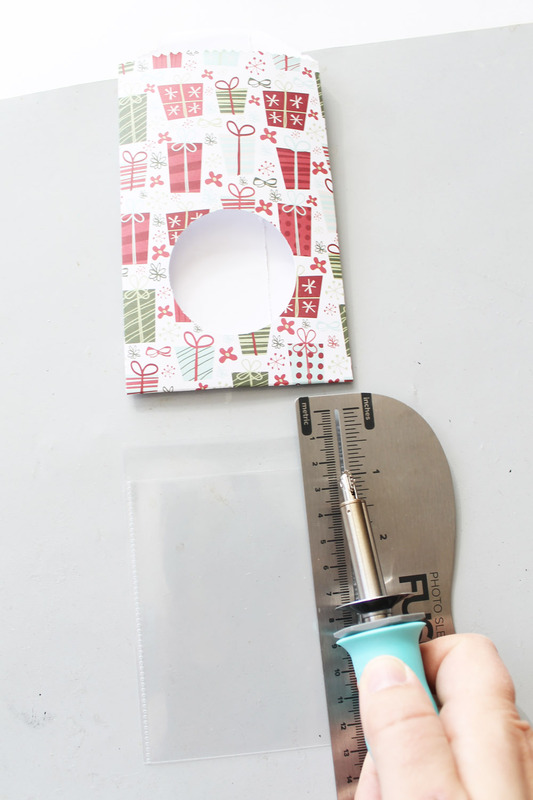 To create a smaller sized bag (3.5” wide), start by trimming your paper to 8” wide. You can use a paper trimmer or the straight edge of the goodie bag guide. Line up your paper using the 8” marks as your guide and tear along the top and bottom of your paper. Use the goodie bag guide to create the folds for your bag and assemble the bags together using adhesive. You can make a lot of bags in a short period of time. It is easiest to make the bags using a thinner paper. 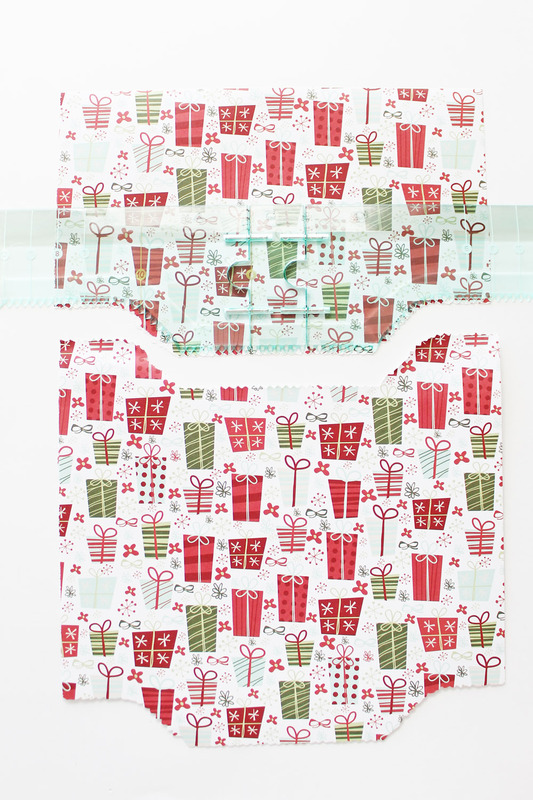 Cardstock and double-sided patterned paper are more difficult to tear and fold. After I have my bags created, I made two banner pieces for each bag. I did one that is a little wider and shorter, and a second one that is longer and thinner. 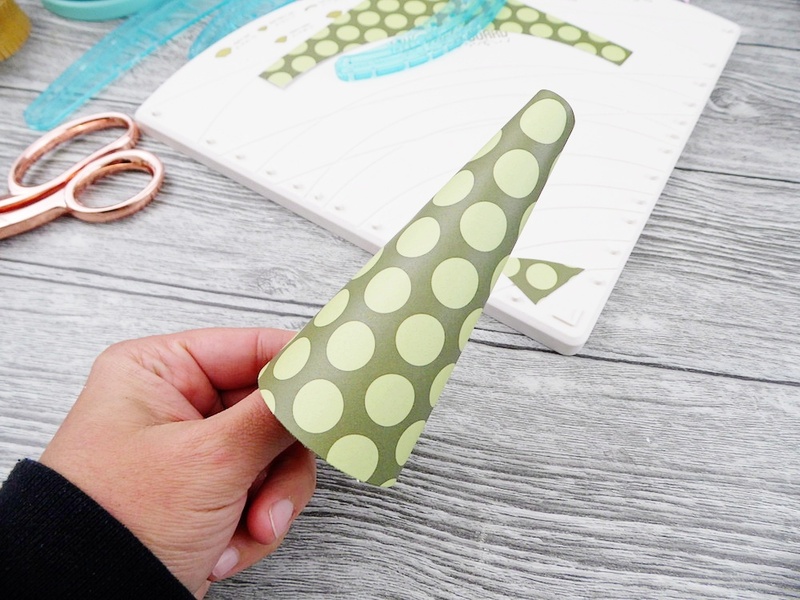 Trim your paper to the width you would like and use the banner punch board to create the V-shape in the bottom of the banner. Then, use your paper trimmer to cut the banner to the length you want. To add a Merry Christmas sentiment, I created a small tag using the Clear Cut punch. I added some Crate Paper stickers that said “Merry Christmas” to each one. Fill up your bag with a special treat. 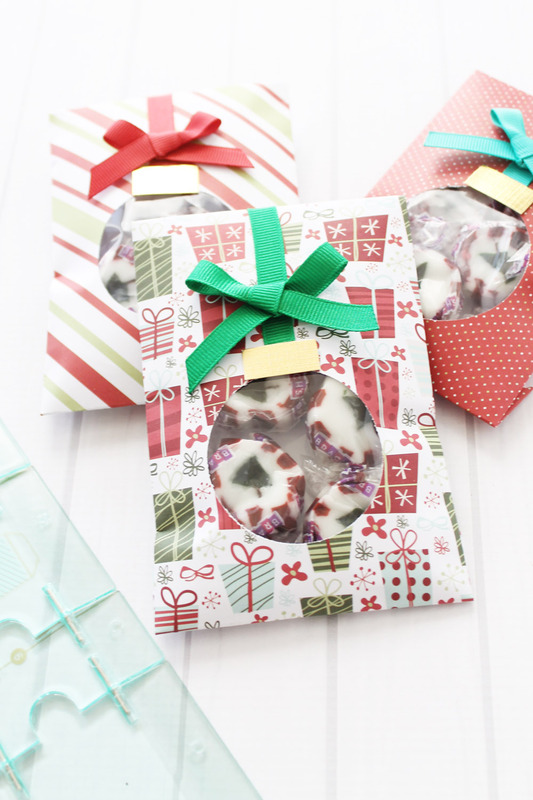 I love these little gummy Christmas wreaths! They are festive and super delicious. Fold the top of the bag over. Layer on the two banner shapes, plus a Christmas die cut ephemera piece. Add on the little tag and clip everything together using a decorative paper clip. 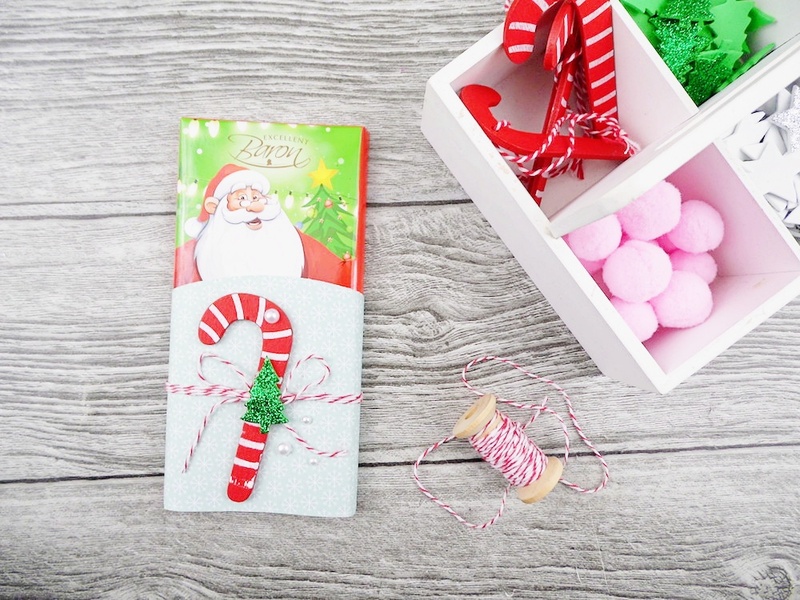 These little goodie bags are perfect for stocking stuffers, class parties, or even as a decorative way to give a gift card. Add in a few yummy treats with the gift card, and I know it will be well received. What is your favorite treat to put in goodie bags for Christmas? Hello everyone! Welcome to the We R blog! It’s Eva Pizarro here today sharing how to turn a common mason jar into a Gratitude Jar with the help of your favorite We R tools. Gratitude is a beautiful virtue and what better way to practice it than with a Gratitude Jar? You can use it with your family or to give to a friend during this holiday season. I decorated the jar and the lid and also hung a tag with a few papers for writing down things you’re grateful for. To make the tag I cut some 2×3 plain copy paper and then used the Perforate blade on my Dial Trimmer to make them tearable. I stapled my paper together with The Staple Board set at “L” for large, and then glued this pad of paper to a tag. The tag has a scallop border made with the Dial Trimmer and I used the Reinforce Hole Punch to decorate it. The jar is just a common mason jar that has a Thickers phrase attached. I love these pink Thickers from The Heart of Home Collection by Pebbles. Aren’t they super cute? Finally, to decorate the lid I used some papers from the same collection and a heart I made using my Heart Clear Cut Punch. You can punch anywhere on the page and align everything perfectly. I love these punches! Have you ever made a Grateful Jar? You can start this year! Teach your kids that you can find a reason to be grateful everyday. Hello and Happy Friday crafty friends! 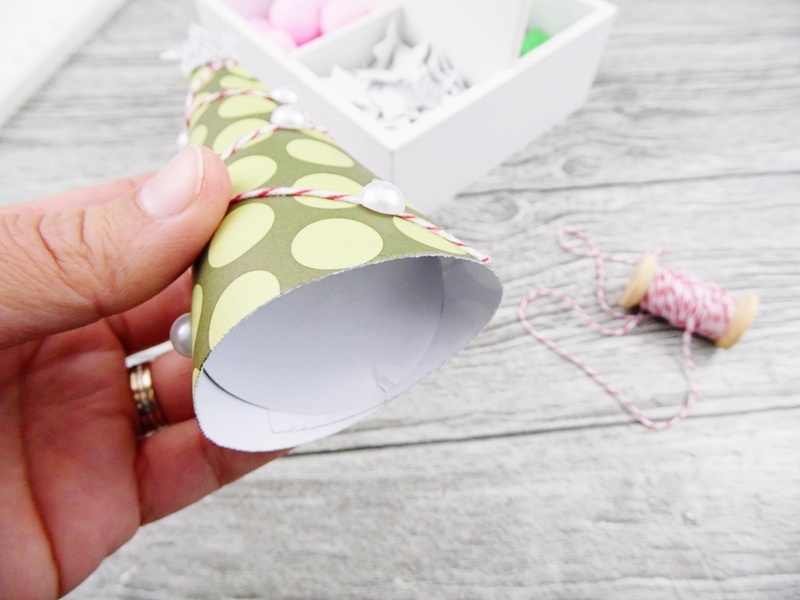 It’s Aly with you today closing off our Halloween Treat Container Week with a fun and easy idea for making Googly Eye Treat Pockets with the Circle Spin & Trim and the Journal Guide. These DIY Halloween Party Favors are perfect for handing out to trick or treaters, for a class party, or for teachers, friends, and neighbors. You can even include them as part of a Googly Eye Halloween Party! Googly eyes are easy to find in crafts stores, but why not make your own? They’re cheaper that way, and you can totally customize them to fit your project. To make these Halloween Party Favors, start by trimming black solid or semi-patterned paper to 4×6 inches. I used plain black Bazzill Cardstock and some black and white papers from the DCWV Okey Dokey 12×12 Stack. Then follow the Journal Guide instructions to make a photo pocket. Tip: be sure to use strong adhesive to hold your pocket securely together. Next, cut several 1-2 inch circles using the Circle Spin & Trim from solid white cardstock. If you’re throwing a Googly Eye Party, cut some larger white circle for bigger eyes. Type up a “punny” sentiment or quote on lavendar cardstock with the Typecast Typewriter, and punch them out with the Clear Cut Tag Punch. Punch a hole in the end for tying. To make your Googly Eyes, add black enamel dots or small paper circles to the center of the white circles. Vary the placement of the black circles to make the eyes appear to be looking different directions. Tie the tag around the top of the treat pockets with black twine. You can add a little adhesive to hold them in place if you’d like. 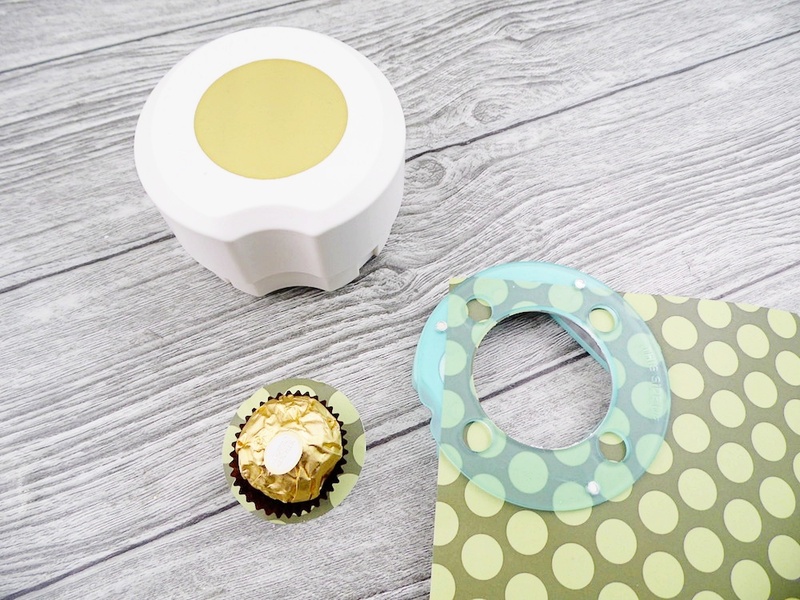 Once your treat pockets are ready, slide in a small individually wrapped piece of candy or chocolate, and watch your recipients smile when you hand them out! Thanks for stopping by today. Have a happy and crafty weekend, and we’ll see you back here next week.